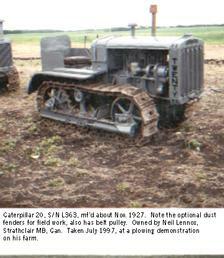 This 20 was a farm tractor, and has a belt pulley. It came from central Saskatchewan, Canada. It was running but the rings and pistons were totally worn out when I got it in '94. It still has the original stamped track plates, but with the centre's torched out for opperation in snow.